ExitAdviser is an online service that helps you market your business to prospective buyers. Before going to market, guidance and tools are provided to value your business and prepare it for sale, including the identification of practical short-term changes. Here's how does it work. Is ExitAdviser a business broker? Not in the traditional sense of the term. ExitAdviser is an online "virtual brokerage" service that enables you to orchestrate the business sale process yourself in a structured way while maintaining confidentiality and using helpful online resources. ExitAdviser is not commission-based. The one-time service fee includes full access to all resources and online services provided. We encourage small business owners to pick ExitAdviser's FSBO (For Sale by Owner) route for an efficient, commission-free business sale. 1. ExitAdviser provides you with a complete set of tools and resources you will need throughout the whole process, not just setting up a sales listing. Before going to market, guidance is provided to prepare your business, including a business valuation and the identification of short-term changes to increase your business’s value. The Sales Memorandum Tool helps you identify the key value proposition sought by buyers. The application then automatically populates the fields in your Landing Page on ExitAdviser, which is then promoted through a targeted Google Ads campaign. We use the Google Ads platform to place our customers' offers directly in front of motivated buyers (i.e., when they seek businesses for sale with Google Search). This is a highly efficient way to address prospective buyers because Google is the place buyers tend to go first — as we all do ;). ExitAdviser is aimed specifically at small business owners who wish to prepare and execute their business sale process themselves (FSBO) along with the guidance and online tools available on ExitAdviser. Business Brokers and Intermediaries are served with the BrokerBoard™ service to create and manage their customer's sales listings. Joseph Blygges, a former business owner explains how he sold his business with ExitAdviser. Where is my business sale listing promoted? Your offer is listed on ExitAdviser's businesses-for-sale marketplace, visited by hundreds of potential buyers each day. Complementarily, you can quickly start your own advertising campaign on the Google Search pages. 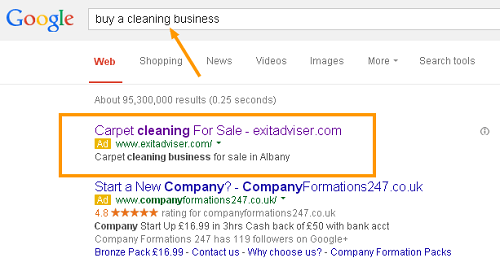 ExitAdviser triggers your Google Ads campaign based on the business category and location you select. Just a few clicks and your own digital marketing campaign is up and running, visible to potential buyers. Additionally, your listing is promoted on social platforms such as LinkedIn and Twitter for Business. A key objective when selling your business is to strike the best possible deal. This is made more likely by following the steps within the 4 stages to prepare your business for sale and fast-track the deal-making process. The one-off fee includes access to all ExitAdviser's premium online resources. This includes online tools, your business-for-sale listing, a prepaid advertising campaign on Google Search platform (mobile and desktop), downloadable templates and sample legal forms, access to nearby professional advisors, how-to guides, email support, and more (we will keep adding more service items). Check out the pricing page for the most recent information. Can I sell my business without involving a business broker? Business brokers provide a valuable service for business sellers; however, there is a charge, which is often up to 10% of the selling price. A smart broker will evaluate whether it's worth their while to spend time on a business of relatively low value, say with an asking price of less than $500,000. In this situation, ExitAdviser offers you an alternative, DIY approach. Discovering ExitAdviser may give you the confidence to go forward with the project yourself, irrespective of the asking price. Should you still decide to use a business broker, you'll be much better prepared and able to understand their language. For Sale by Owner (FSBO) is a method of selling a business without the use of a business broker. Small business owners may employ online listing/advertising services to market their own business but do not pay a commission and represent themselves without the help of a business broker throughout the sale. What about confidentiality? Is my data safe and protected? Confidentiality is of the utmost importance to us. ExitAdviser will not reveal your personal or commercial information to third parties (including prospective buyers). It’s your own freedom (and responsibility) to decide what to communicate to the market and to potential buyers. Typically, you will not share your business name, e-mail address, telephone number, your name, or other such details on your Landing Page that may reveal your identity (also known as "blind" listings). ExitAdviser uses secure Microsoft Azure Cloud services. For more details on the strict security, confidentiality, and data protection provisions in the system, refer to ExitAdviser's Terms and Conditions. How do I get started? Is there a suggested sequence of steps? 1. Navigate to the Go-to-Market Tool and update the contents of your Landing Page. Your Landing Page is what will be publicly visible to potential buyers. It shall contain main facts about your offer, images of your business, the Asking Price and additional files (if any). 2. After setting up your Landing Page, you may want to start your advertising campaign. While staying with the Go-to-Market Tool, click on the "Advertising" tab, then click the blue START button. Your Landing Page will be advertised on Google when people search for businesses (for sale) relevant to your category and location. 3. You may want to re-check your Asking Price. We provide an online Business Valuation Tool to calculate your Asking Price. 4. You may want to create a Sales Memorandum. The Sales Memorandum is a document used by sellers to communicate key information about the business to prospective buyers. Make use of the Sales Memorandum Tool. When you meet serious buyers, they will ask for more information about your company/offer. Therefore, have your Sales Memorandum well prepared. How long is my subscription valid, can I renew it? It's one-off. For a one-time payment, you will get the services rendered for 12 months. There are no monthly charges, and no auto-renewals. When your initial service period expires, you may renew it for another term. Yes. ExitAdviser's Money-Back Guarantee is valid for 30 days from the purchase date. Should you not be satisfied with the service, you may ask for a full refund. Please note that the refund does not apply if you've already started your Google Ads advertising campaign using the Go-to-Market Tool; or if you used a free trial before upgrading to a paid plan. Nor does it apply to the BrokerBoard subscriptions (a set of special service plans for Business Brokers and Intermediaries). Do you provide e-mail support? Yes. We provide support via email to our customers. We do our best to respond to every email within one–two working days. Are credit card payments made on ExitAdviser.com secure? Absolutely. We use top security providers such as Stripe and Braintree (a PayPal company), and we never store credit card information in our database. Do you offer a free service? Do I need to provide my email and password when signing up with ExitAdviser? Not necessarily. There are three equally secure ways to sign up to ExitAdviser: 1) with your e-mail and password, 2) through Facebook, and 3) through LinkedIn. We may in future add other social network options. However, the email address registered with your account works as your unique identifier. ExitAdviser will not disclose email addresses or other personal information to third parties. Your email will be used only for professional communication (no ads, no promotions). Do I need to provide my real business name when signing up? No, you do not need to disclose your business name. Instead, you can use a project name of your choosing so that we have a reference point for your account and data in the system. ExitAdviser needs a label to set up your business account and identify your data. A project name of your choosing will suffice for this unique system reference. What about the file(s) I upload – are these visible on the Landing Page? Yes, the files you upload with the Go-to-Market Tool can be downloaded by anyone visiting your Landing Page. If that's not your intention, then do not upload any files. Alternatively, only upload files that add value to your offer, but do not contain confidential information. In the course of your Google Ads campaign with ExitAdviser, you may need to buy further ad click packages to refill your marketing budget.